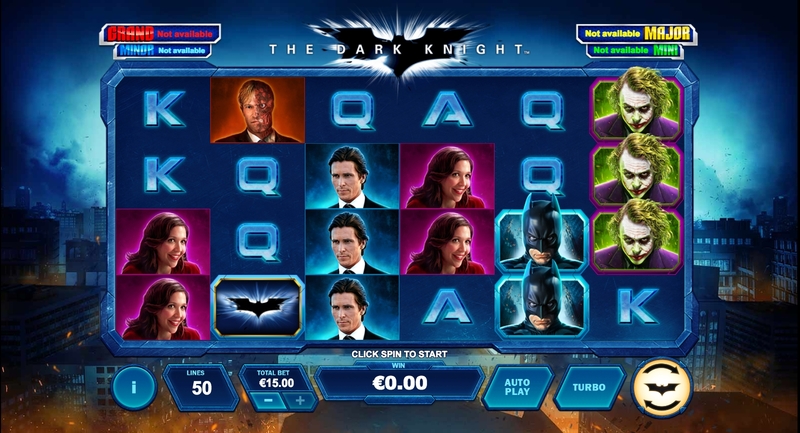 The Dark Knight slot is a Playtech-developed title based on the 2008 blockbuster movie of the same name. Say What? What happened to Microgaming's The Dark Knight? Well it disappeared when Playtech took over the franchise to develop DC Comics-inspired slot games. Playtech already have a bunch of slots in casinos such as Batman Begins, Superman 2 and Man of Steel to name a few. Therefore it was little surprise that at some point we would return to Gotham City for another episode of anarchy and crime fighting. So will Batman keep close watch over our balance or will it get frittered away by the Joker? This is a rare 6 reel slot, which contains 4 rows and 50 paylines. Characters from the blockbuster movie feature on the reels such as Commissioner Gordon, Two-Face, Rachel Dawes and of course Bruce Wayne. Top paying symbols for a 6-of-a-kind (6OAK) are Batman - paying a handsome 75x and The Joker - paying 35x for a 6OAK. Lowest paying are the standard card symbols A-K-Q. The Bat symbol is the Wild and appears on reels 2 through to 5, substituting for all symbols except the Bonus symbols. The Batman re-spins feature is triggered by landing stacked Batman symbols on reel 1. All Batman and Bat Wilds will be locked and a coin is then tossed. Each time the coins land with Batman face up you will get extra symbols lock in place. The feature will continue until the Joker appears face up, with a maximum 8 re-spins available. Should The Joker symbol appear stacked on the 6th and final reel, then you will trigger The Joker re-spins feature. This is almost the same as the Batman re-spins feature, but the other way round (As in Batman will end the feature and The Joker continues it). 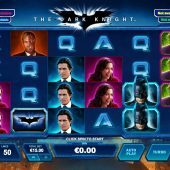 The Dark Knight free spins feature - Land the Batman Bonus symbol on reels 2 and 3 and you will activate 7 free spins with Batman symbols turning Wild and locked for the length of the feature. Agent of Chaos free spins feature - This is activated by the Joker Bonus symbol appearing on reels 4 and 5 then you will also get 7 free spins. The Joker symbols appear in larger blocks potentially delivering larger wins. Gotham City free spins feature - This feature occurs when the Batman Bonus symbol appears on reels 2 and 3 and The Joker Bonus symbol appearing on reels 4 and 5. You will get 7 free spins and both the locked Batman Wilds and the large Joker symbols for potentially even bigger wins. The Dark Knight is part of the DC Super Heroes Jackpot network, with 4 progressive jackpots available to win at anytime. There is a chance of winning one of these jackpots with a Mini, Minor, Major of Grand progressive jackpots available. The Grand jackpot is worth a minimum of 1 million coins.